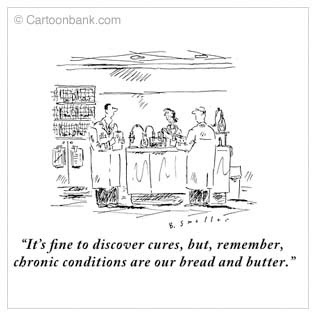 Pharma Marketing Blog: New Yorker Cartoon: A Slice of Medico-Pharma Life! New Yorker Cartoon: A Slice of Medico-Pharma Life! Is it just me, or is New Yorker magazine on an anti-pharma spree? I subscribe to New Yorker magazine because I am a former New Yorker and frequently visit that city to get some culture under my belt and some shopping done. I admit, however, that I read the New Yorker cartoons first and merely glance through the show and cabaret reviews! Lately, I've been seeing more and more New Yorker cartoons that focus on what I call the "Medico-Pharma Complex;" that is, the relationship between medicine/medical research and drug development. The cartoon shown here is from the September 15, 2008, issue of the magazine and can be found online at the New Yorker CartoonBank Web site. I can imagine the caption being an exact quote of a comment that a pharmaceutical company CEO might have said to his head of R&D. "[Many countries] seem to imagine that pharmaceutical companies can come up with new cures and medicines without putting up blockbuster capital." -- Billy Tauzin, 2005 Competitive Enterprise Institute Annual Dinner; see press release here. "Transforming Today's Science Into Tomorrow's Cures" -- Samaritan Pharmaceuticals. I could cite many more examples of the drug industry's use of the words "cure," "recovery," etc. when expressing their goals. A cure is a good goal to have, but when are we going to reach it? Are cures for high blood pressure, diabetes, Alzheimers, insomnia, etc. going to come from the drug industry? Not unless you believe that taking a pill every day for the rest of your life is a cure. What I'd like to have is a course of treatment for high blood pressure that involves two weeks of drug therapy and then no more high blood pressure for years or the rest of my life! You know, just like some of the first drugs ever developed: antibiotics! I have a question about this post. Will you please email me when you get a chance. Thank you in advance. Great blog..cool write-up and lovely information.